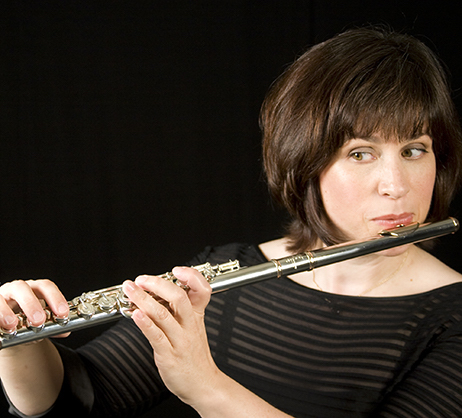 Emily Skala has been the Principal Flutist of the Baltimore Symphony Orchestra since 1988 and a faculty member of the Peabody Institute since 1989. Recent years have provided substantial opportunity for international travel to Brazil, the United Kingdom, France and Germany, to perform on tour and at music festivals worldwide: Southbank Centre’s “The Rest Is Noise” Festival (UK), Campos do Jordao Winter Festival (Brazil), and Carnegie Hall. 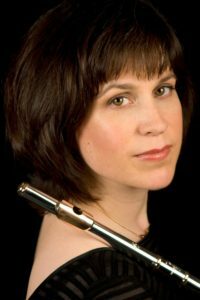 An expert in orchestral repertoire, Ms. Skala has performed, adjudicated, taught, and commissioned new works at the National Flute Association’s annual conventions. Can you give us 5 career highlights? 1 Itzhak Perlman's compliment of my Brahms Symphony #4 solo. He loved the unforced low notes at the end! Something he never gets to hear. Validation from artists on this level is extremely meaningful. Even if it is about only one or two notes. 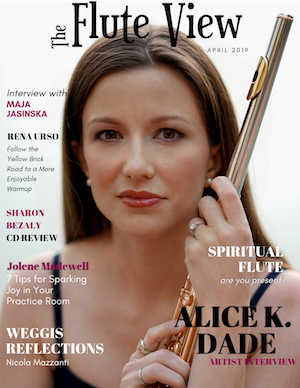 2 Making the semifinals of the 2014 Berlin Philharmonic Principal Flute search; being the only American flutist to achieve this; and being one of only two women to advance to this level. It was the most fun audition experience I ever had (in fact, I didn't know they could be fun)! I felt like I had truly accomplished something that day. And while I was there, I was able to listen to an afternoon rehearsal of Schubert's "Rosamunde" Overture. The orchestra was supposed to have performed that week's concert under Claudio Abbado's leadership. Sadly, Maestro Abbado had passed away four months earlier. They kept his program in tact, however, and played the Schubert without conductor as an homage to this important musician. It was Abbado's favorite piece. The richness of the sonorities that emerged from the orchestra and dedication to musical collaboration and expression among the musicians of the Berlin Philharmonic was breathtaking. I will never forget this sound. It was something I have never heard before and never expect to hear again, unless I can manage to fit more travel into my life! All the stories we hear about this orchestra are true. So if you can afford to go, you must hear the Berlin Philharmonic in the Berlin Philharmonie! 3 I cannot forget the Aspen Festival Orchestea's performance of Mahler's Symphony #3, with the late and wonderfully musical Maestro Sergiu Comissiona conducting. In this performance I worked side by side with my first great mentor and Principal Flutist of the Aspen Festival Orchestra, Albert Tipton. All this when I was just 16 years old. This week of wondrous music making confirmed my love of orchestral flute playing. I knew I was doing absolutely the right thing. 4 Working with Yuri Temirkanov as Music Director of the BSO from 2000-2006. What he can communicate with a pout of the lips, a sweep of the arm or an impish smile and a furled brow is profound. There is just no other way to put it. I grew a huge amount as a musician during this era of the BSO. 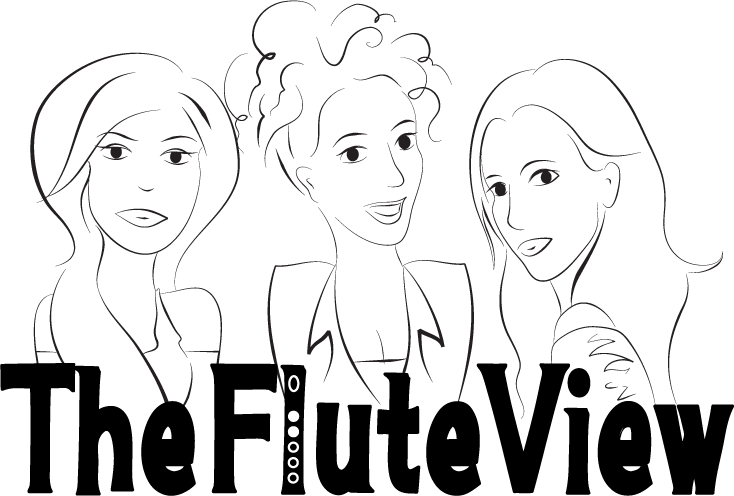 How about 3 pivotal moments that were essential to creating the artist that you've become? 1 In addition to studying with six wonderful flute teachers during the course of my childhood and college years, I took lessons with great musicians who are NOT flutists: Murray Perriah (concert pianist), Steven Doane (cello faculty member at the Eastman School of Music), Richard Woodhams (Principal Oboe, Philadelphia Orchestra) and, most recently, with Marilyn Horne (world renown mezzo soprano). The perspectives of these masters helped to free me from the limitations of my own instrument. This in turn opened my mind to the goal of making anything I play on the flute sound simply like a musical expression born out of an era and painted by a composer's personality and inspiration, rather than merely like a difficult piece which happens to be written for the flute, played by a talented flutist. What we communicate through our instruments is far more important than that which we have mastered technically. It was never important to me to be a show off. That is not what makes me excited about music so I do not like to assume it is what gets others excited about it either. 2 Emmanuel Ax used to perform often with the BSO when David Zinman was Music Director. His advice to record the Brahms Clarinet Sonatas, since that was my passion at the time, gave me the courage to be the first to record the wonderful 1970s transcriptions of the Op. 120 Sonatas by former Principal Flute of the Jerusalem Philharmonic, Hanoch Tel-Oren. (At the time, transcriptions in general were being criticized, so I was concerned about negative reaction. Now, by stark contrast, transcriptions are actually cutting edge!) The process of making this solo recording gave me the opportunity to refine my playing to an even greater degree than had orchestra life alone and the reviews were very positive, rather career-affirming. After this edition of Hanoch's was no longer in print, Emmanuel Pahud even contacted me to borrow my music so he could perform it on a recital, he liked the transcription so well. It was a happy ending to a project which took years to realize. My collaboration with my very good friend and world class pianist, Norman Krieger, was particularly rewarding as his Brahms interpretations are well-informed, full of love and rich with imagination. 3 Lastly, I would say that being born into a musical family and beginning my formal musical education in the Great Lakes State is my greatest asset. The midwestern states all had phenomenal music programs offered in their public school systems. Michigan was no exception. The expectations were so high. My high school band director and local youth orchestra conductor, Russell Reed, was a force majeur in the initial years, not to mention the influence that the Interlochen Arts Academy and Summer Music Festival had over all of us Michiganders. We had Interlochen-style challenges almost weekly, and were steeped in a culture of healthy competitiveness which fostered personal responsibility and preparedness. Mr. Reed used to tell us that the difference between an amateur and a professional is the ability to be consistent. So simple and so true. His presence in my early years was very motivating and his influence really made a lasting impression. Do you teach? masterclasses? What do you like best about teaching? Occasionally I am invited to give a masterclass out of town. By and large I am so busy with my performance and private teaching schedule that this is difficult to arrange. 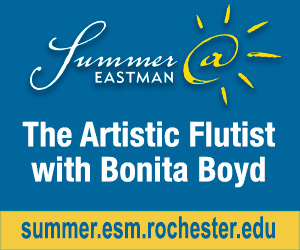 However, this summer I am presenting as a guest faculty member and performer at the Bonita Boyd International Masterclass at the Eastman School of Music during the first week of August, and I have hopes of increasing my presence on the masterclass circuit in the near future. Past invitations have taken me to Oberlin Conservatory, the University of Connecticut, George Mason University, and the Eastman School of Music, and even to Korea for a winter flute camp. For adult amateur flutists, I participate annually in the Baltimore Symphony's Academy activities, which is like summer music camp for adults and includes a masterclass, lessons, and coaching as well as side by side opportunities to play with the BSO. In my role as faculty of the Peabody Institute of Johns Hopkins University, I continue to give weekly orchestral repertoire classes to help prepare the students for audition successes. I have been teaching both a private studio and class here since 1989. Teaching is a richly rewarding opportunity not only to mentor and to help others grow but to deepen ones own abilities, too. Together we hone our aural perceptions, our self-perceptions, and our overall general awareness of many aspects which influence musical performance: these include, but are not limited to, our internal and external environments, our daily regimen, our posture and other elements of health, and our personal truths and patterns. We have a lot of fun expanding our capacities for imagination and creativity, drawing parallels between what we do on a microscopic level and what is true everywhere in the universe on a macro level. I find it is important to emphasize how we are all connected to everything else. 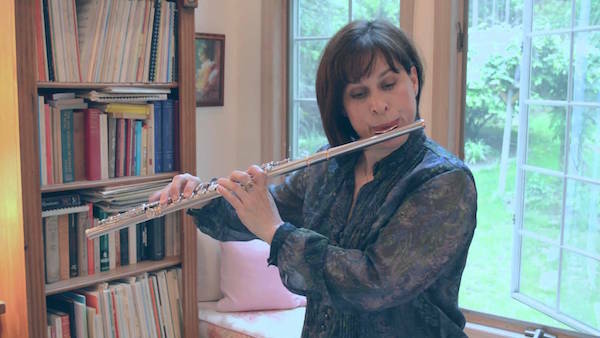 In a world of distractions, teaching flute and promoting the study of the flute and its diverse repertoire is an opportunity to practice being grounded, authentic, flexible, fully communicative, and to establish human connection for both student and teacher. All of this is a long way of saying that what I love most about teaching is the act of helping others realize their fullest potential doing that which they love most. This question is a bit harder to answer, and it may be because performing classical music is actually one of the most complex activities in which a human being can engage. I have recently learned that it is the only activity neuroscientists can find which relies upon both hemispheres of the brain equally. In fact, there was a neurosurgeon who gave a presentation for the musicians of the BSO once. He had begun his life as a flutist, spent some time as a ballet dancer, and ultimately settled upon becoming a neurosurgeon. According to this accomplished individual, the demands of live performance on the human system are far greater than those required to perform intricate surgeries such as he does as a medical professional. This has to do with the highly focused, instantaneous processes taking place within the human organism at lightening speed for such a sustained period of time in order to achieve an outcome that satisfies a very high modern day performance standard. Just writing all of that tends to boggle my mind! So in consideration of all of that, what I love most about performing is the sheer beauty of the miracle of this coordinated effort undertaken by so many at once; that together we can transform lives by manifesting true harmony on earth. I guess this makes me feel that I am doing something invaluable every day. In a few weeks I will perform as soloist in Bach's Brandenburg Concerto No. 5 with our concertmaster, Jonathan Carney, and Marin Alsop on the podium and I will sit on a committee to hear an internal advancement audition for the piccolo opening we now have; there will be a week of teaching and performing activities for the BSO Academy week (the adult amateur musician's "boot camp" I was talking about earlier); we will present our BSO Summer Season, which will include a contemporary music festival as well as full orchestra concerts; in mid-July I will record some chamber music for composer Lori Laitman; I will teach lots of private lessons this summer; and my daughter will be home from college...perhaps we'll squeeze in a vacation before I go up to Rochester, NY for Bonnie Boyd's masterclass! Officially, our 2017-2018 winter season begins in mid-September and Peabody will be off and running by late August, beginning with an Ensemble Placement Audition for new and returning students. My personal goals are to become more organized, to tie up lose ends, and to simplify my life, all the while continually finding ways to make my flute playing more beautiful, more brilliant. Professionally, it is my goal not to stay in Baltimore for the remainder of my career. I think joining a university setting as a full time faculty member would be the perfect transition after I feel complete with my life as an orchestral flutist. I have never fully relinquished the dream of becoming a world famous soloist, but in lieu of that, I would absolutely love to make a few more solo recordings. I'm a little bit like Mahler and Brahms in this way: I would say that nature inspires more than anything else and I draw upon past experiences to inform my interpretaions. Second to that, incredible musicians and open-hearted people inspire me. My greatest challenge has been to unlearn the notion that it is excellence which garners positive attention, or that it is the best player who wins the job, or that it is the most effective teacher who receives the recognition. Basically, you cannot control outcomes of auditions, competitions, or the general reactions of others. You can only be your most authentic self and put your best foot forward at all times. It is very difficult to practice detachment to outcomes but this is essential for maintaining self respect. In music it would appear that there are more failures than there are successes. This seems to be true for nearly all of us in this profession. Would it have helped me to know this in advance? Come to think of it, my middle school band director warned me of this phenomenon, specifically as it relates to flute players. Rather than discourage me, I think it lit a fire. So I am definitely learning all of these hard lessons completely by choice. Who were your music mentors? and what did you learn from them? This is a very astute question, Viviana. I tend to be an idealist, so I was very surprised to find out over the course of ny education that every teacher had their own specialty, rather than that they each offered a comprehensive approach to teaching. As I mentioned earlier, I had six major teachers, all with their own primary focus. 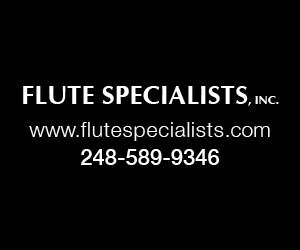 My first teacher was Kathleen Course, Principal Flute of the Flint Symphony. She was a powerhouse kind of teacher and had no difficulty accompanying her students on the piano throughout the lesson, unless of course she was playing flute duets with us. She was bold, assertive, expressive and not a little intimidating to a shy 11-year-old! But by the time I had been with her for five years, from Mrs. Course I had learned a kind of fearlessness toward sight-reading and regarded the challenges of learning new repertoire, trying new sounds, learning new techniques as nothing but fun. From here I went on to study one regrettably short school year with Clement Barone, Piccolo of the Detroit Symphony Orchestra. Mr. Barone had a St. Bernard with a deep, at times startling, bark. From Mr. Barone I had my first lessons on the Vivaldi Piccolo Concerti and the Glück Dance of the Blessed Spirits. I definitely learned to be mindful of large and powerful dogs during my Junior year of high school, and I will always be grateful to Mr. Barone for introducing me to my next two influential teachers, Albert Tipton and Harold Bennett. I was so fortunate to study with Albert Tipton, former Principal Flute of the Detroit Symphony, for three summers at the Aspen Music Festival. This was my introduction to identifying difference tones as a tool for accurate intonation, improvised flute class tuning exercises, and lastly, the challenges of playing unaccompanied Bach. I also had never heard anyone play piccolo harmonics on the flute with such impressive projection as Mr. Tipton could achieve. In the cacophony of the Festival Orchestra warming up before rehearsals it was possible to hear Mr. Tipton practicing his whistle tones even as I sat at the back of the tent. I came back home after my second summer at Aspen to learn that we were moving to New Jersey and once again I would be starting with a new teacher. This time I had to audition for the opportunity to study with my next teacher. He was a very busy man, a very dedicated teacher, who worked into the wee hours of Christmas morning if he could find a student willing to come. Actually, I think that was the only way he could fit us all in! Clearly it was important to him that we were all as serious about the flute as he was. I started bi-weekly lessons with Harold Bennett at the top of my Senior year of high school while I acclimated to an entirely new life from top to bottom. From Harold Bennett I learned how to practice. This had been a complete mystery to me for years but no longer would there be any question about how to prepare properly for a perfect performance. He left no aspect of the fundamentals of technique unaddressed. To this end, Harold Bennett provided a fully comprehensive series of practice variations which we applied to several books of Andersen études. A new étude every lesson. His expectations were very clear and he was someone I felt it was very important never to let down. So I came prepared, if not a little frightened, to every single lesson. Additionally, Mr. Bennett kept a strobe tuner in his studio and every now and then he would have me stop on the final note of the étude to check the accuracy of my ending pitch relative to the beginning pitch. In this way we honed an aural attentiveness to foster consistency in intonation and absolute discipline in my daily practice. The following year I found myself in college in Philadelphia and studying with John Krell, Piccolo of the Philadelphia Orchestra. 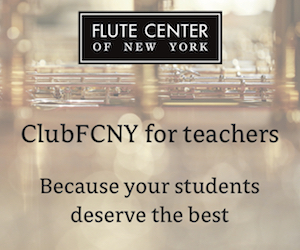 All of these four most recent teachers had been graduates of the Curtis Institute where they studied with the legendary William Kincaid, long-standing Principal Flute of the Philadelphia Orchestra. Until this time I had never really focused so keenly on the principles of musicianship as I had under Mr. Krell's care. From this gentlemanly teacher of humble character I learned phrasing and graduated dynamics and how to taper to nothingness, and how to re-enter again from nothingness, and almost most importantly, I learned how to articulate and color the sound in all the various styles a string player might be using: detaché, martelé, spiccato, flautando, pizzicato, and more. I began to overcome my discomfort with sostenuto in slow tempi, I had occasional lessons on the piccolo (apparently thin lips are best for this instrument), and we spent time on Debussy and Ravel, the French impressionists of classical music, and more unaccompanied Bach, but this time on the piccolo! Without Mr. Krell's attention to the smallest of details no doubt I would not have done as well as I did when I arrived at my dream school, the Eastman School of Music, for my Junior and Senior years of conservatory. Here, under Bonita Boyd's gracious and loving tutelage I learned how to clarify my tone and to project in large spaces. I had arrived with a very petite, compact sonority, but this was not quite enough for my orchestral aspirations. From Bonnie I began to understand also that each flute, the material it is made of, and the nature and values of each flute maker, offered its own set of mechanical and acoustic properties. There is one other thing that I learned from Bonita Boyd: it is never too soon to start taking orchestra auditions. 1 I love my fish and frogs in the water feature (pond) I inherited when I bought my house. I have salamanders and snails in there as well and it is especially exciting to see when the tadpoles have hatched! 2 If a snake gets into the house, or a bird, or insect of any kind, I am most determined to help it get back outside. Don't know where I'd be without an extension ladder and a butterfly net! And I will stop the car for a frog or a turtle crossing the road, get out and help it to the other side. I think the snapping turtle was the scariest rescue. 4 I love crime dramas, documentaries, and movies based on true stories. In fact, when I read, It is almost always non-fiction. 5 I am saving all my needlework projects for retirement. 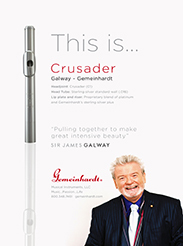 What 3 things would you offer as advice for a young flutist? 1 Follow your heart. 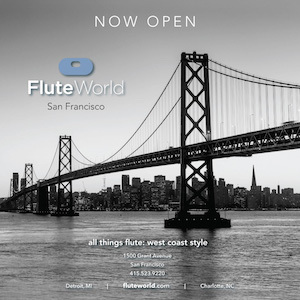 Flute playing is hard enough. If you don't love it you will wish you had not pursued it. 2 When someone knocks you down get back up and call them out for what and who they truly are. Never let a bully hide behind a façade of gentleness, kindness or an image of success. That will only allow them to go on hurting others, too. 3 Avoid excessive honesty. Keep that for your closest family and friends. Not everyone deserves inner access.